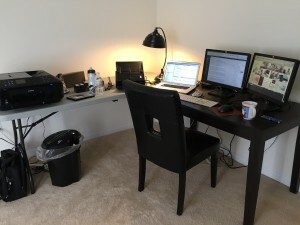 If you set up your home office incorrectly, “working from home” will instead feel more like “living at work.” I had to learn that the hard way. In fact, after my first home office experience, I vowed never to do it again. Fifteen years later, I finally decided to give it another shot, and, as I write this article from my nearly perfect home office, I can tell you that it has been one of my best decisions. Choosing the space for your office is one of the most critical steps for starting a business, and by following these steps, a home office will become a legitimate option. I used to believe that the difference between thriving and languishing in a home office was based primarily on the psychological makeup of the person in that office. I still believe there is some truth to that, but now that I’ve experienced both, I believe that the organization of the home office and corresponding work habits play a much bigger role. Dedicate a room to be your home office. This room should be for business only. Don’t put a desk in your living room and call it a home office. When you go into this room- you are going to work; when you leave this room, you are leaving work. This is absolutely critical to maintaining a separation between work time and personal time at home. Get ready for work as if you were going out in public. Take a shower and put on appropriate clothes for work. It’s tempting to work in your robe, but it’s hard to act and feel professional, if you look like a slob. Use a real office desk. Desks that can adjust between standup and sitting are ideal for any office, but a standard office desk with plenty of useful surface area and drawers will do. Buy a laser printer. The vast majority of ink jet printers are too slow for business. You don’t want to be late to a meeting, because it takes 30 minutes to print copies of your proposal. Go paperless. This doesn’t mean stop using paper- this just means stop storing paper. Even if you print something out to read or make notes, you can still scan the document and save it digitally for later use. Filing physical paper will quickly eat up space in your home office. Use some or all of these tools to eliminate as much paper storage as possible. Document scanner: Industry leaders are Neat and Fujitsu’s ScanSnap. Smartphone scanning app: Scannable (By Evernote) is the best smartphone document scanner available. Document shredder: Fellowes is a very respectable brand and has reasonable prices. E-signature service: Docusign and Adobe eSign Services (formerly Echosign) are industry leaders. If you use Gmail or Google Apps, Hellosign has a great plugin that makes e-signing attachments really easy. Online fax services: If you do any faxing or need a fax number, use an online fax instead of a traditional fax machine or an all-in-one. Here is our comparison of the best online fax services. Sign up for an executive suite for meetings and office support. Executive suite services like Davinci can be very useful for hosting meetings or renting out an office for a few hours. They also typically offer some useful admin services like virtual receptionist services. Get a virtual PBX or business VoIP phone system. When you work from home, you don’t want to sound like you’re working from home. Use a virtual PBX service or a business VoIP phone system to get business phone system functionality (like employee/ department extensions, corporate voicemail boxes, an auto-attendant, etc) without breaking the bank. Use cloud collaboration tools to ensure smooth workflow between yourself, contractors and customers. Use Trello’s project management service for projects and related tasks. Use Dropbox to share files and folders. Skype is great (and free) for instant messages, video meetings and screen sharing. This is especially handy for managing and working with contractors. Google at Work (formerly known as Google Apps) is still the best tool for creating and managing docs and spreadsheets with multiple editors. It handles simultaneous user editing incredibly well. iDrive backup is inexpensive and easy to use. Back up all your files (even the ones in Dropbox) in case of theft, fire or flood. Hang a giant marker board in your office and use it to post weekly and / or monthly goals. If you work from home, you’ll likely be mixing personal and business tasks throughout the day. Get a to-do list manager that allows you to organize different types of tasks (RememberTheMilk is a great one). When you work from home, you won’t have anyone to remind you about appointments and meetings, so use your calendar app religiously (Google Calendar is fantastic, especially if your email is powered by Google). Buy a separate table for spreading out files, so you don’t have to clutter your primary desk when working on a project that requires a lot of paper. Don’t skimp on your keyboard and mouse. You’ll use these constantly, so don’t settle for something that doesn’t work perfectly. Make sure you have chargers for your devices setup on your desk. You’ll likely use your smartphone aggressively, so make it easy to keep the battery full. Buy a good hands-free headphones and mic combo for your phone. If Bluetooth is an option for you, these LG Tone headphones are great. Hang some personally inspirational pictures, quotes or memorabilia in your office. I have a framed picture of Teddy Roosevelt that my father gave me with “The Man in The Arena” quote. It’s my favorite. Keep fuel nearby. An insulated water bottle, single serving coffee maker and trail mix can keep you charged before and after lunch. Buy a large file cabinet for files that require a hard copy and office supplies. If you go (mostly) paperless, you won’t need too much of this for files, so you can use the rest of the space for extra paper, pens, staples, folders, printer ink, etc. Sign up for an Amazon Prime account to re-order office supplies. Subscribe to daily and weekly industry-related podcasts (iOS has a native Podcast app, Android users will need to choose and install a podcast app). Listening to insightful podcasts while exercising, taking your dog for a walk or doing house chores is a great way to absorb more information without using extra time. Because you won’t be in an office surrounded by people who can teach you things, it’s important to continue learning. One way to accomplish that is to find online classes through sources like Udemy that will help you sharpen existing skills and build new ones. If you’re working from home, you’re likely to have dozens of online logins. Don’t put yourself at risk by using the same login information on every site. That’s how identities are stolen. Use a password manager like LastPass to generate, store and provide easy access to all your login and password information.